Halassi, I., Elafri, A., Belhamra, M. & Houhamdi, M. (2016). Répartition et abondance de l’Érismature à tête blanche Oxyura leucocephala dans les zones humides du nord-est algérien. Alauda 84: 25–34. 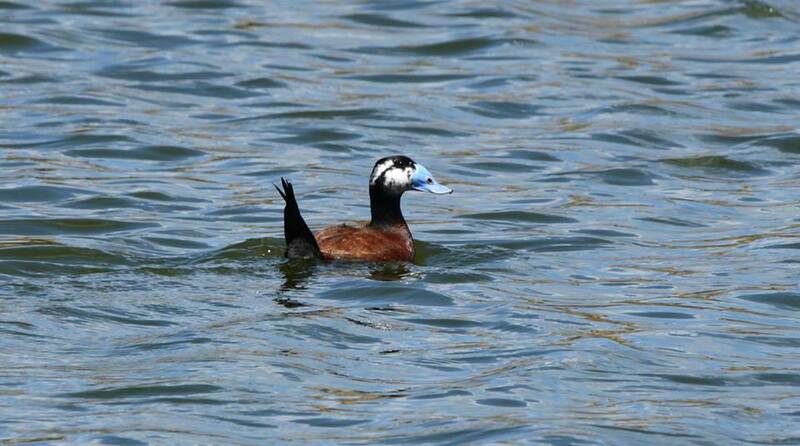 Status of the White-headed Duck Oxyura leucocephala in Northeast Algeria. The globally threatened White-headed Duck is one the most rare duck species in the Western Palearctic. Its distribution in Algeria is mainly restricted to the northeastern part of the country and the Hauts-Plateaux. In 2013 and 2014, 694 individuals were counted. The studied sites harboured distinct numbers in winter and in summer of the two years. The p-values (Kruskal Wallis test) were lower than 0.05. The Lake Tonga showed the highest numbers in winter and the Boussedra wetland in summer. The results indicated a stable occurrence in the studied areas without any difference between the two years. The PCA analysis showed a significant correlation between the distribution of this species and three following main factors: vegetation, surface area and water depth at the Boussedra wetland, Lake Tonga and Garaet Hadj-Taher. The lower occurrence in other parts of the studied areas, particularly on the Hauts-Plateaux, is mainly the consequence of drying out process and habitat degradation. This entry was posted in Algeria and tagged Boussedra, breeding, Garaet Hadj Tahar, Lake Tonga, Oxyura leucocephala, Ramsar wetlands, waterbirds, White-headed Duck, wintering. Bookmark the permalink.